Higher quality leads and customized customer data at scale. Schedule a free demo at leadgenius.com/twist. Today’s episode features two superstars in their respective fields. 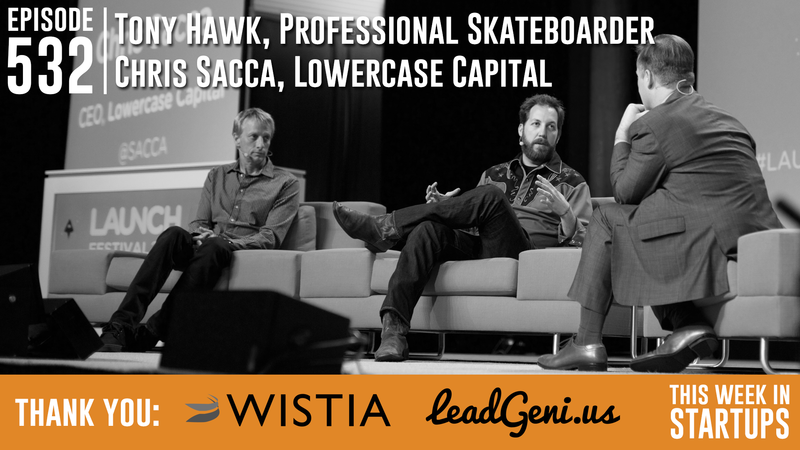 Tony Hawk is the masterful professional skateboarder who catapulted his sport into the national spotlight, and Chris Sacca of Lowercase Capital is a legendary angel investor (Twitter, Uber, Instagram, Kickstarter). Tony and Chris have been long-time friends and both talk in-depth with Jason at the LAUNCH Festival 2015. It’s an awesome, dynamic conversation about their friendship, how each took massive risks to reach the top of their profession (eating ramen for years… borrowing money from assistants…), how Tony’s video game was a tipping point for skateboarding and why he he shows up unannounced to random parks to skate with kids, the amount of hustle it takes to be great, how moving outside of Silicon Valley actually helped Chris’s business, how Tony and Chris think about their legacies, what they are each looking forward to in the future, and how Tony uses Twitter for a worldwide treasure hunt, and how Chris is looking forward to another crash in tech so the pretenders clear out. Join us!